Many who know me know I have a plastic addiction. I love these little blocks and slopes, plate, figurines and doodads that you can stick together to make whatever you want. Just a humble construction toy? Nay, the construction toy. A marvel of engineering, a cultural icon, a medium for sculpture, a product which cannot even cheapen itself through endless tie-in licensing deals. Lego is one of those rare companies that has held my loyalty and more importantly my respect from childhood on to today. Now, as a grown man, I can appreciate just how damn clever the whole Lego system really is, and I find joy in sticking bricks together to make material my abstract whims and notions. Even just running my hand through a pile of ’em is therapeutic in its way. That distinctive jingling of plastic bits triggers nostalgic feelings, as well as inspires contemporary creative impulses. Plus, you can take it all apart and reuse the same elements over and over again. Due to its universal standards of design, any new set added to the collection becomes integrated into the whole, like a new idea introduced to an established breadth of knowledge. Nothing stands alone; it is all connected because it can all be connected. So which set did I get? This one! 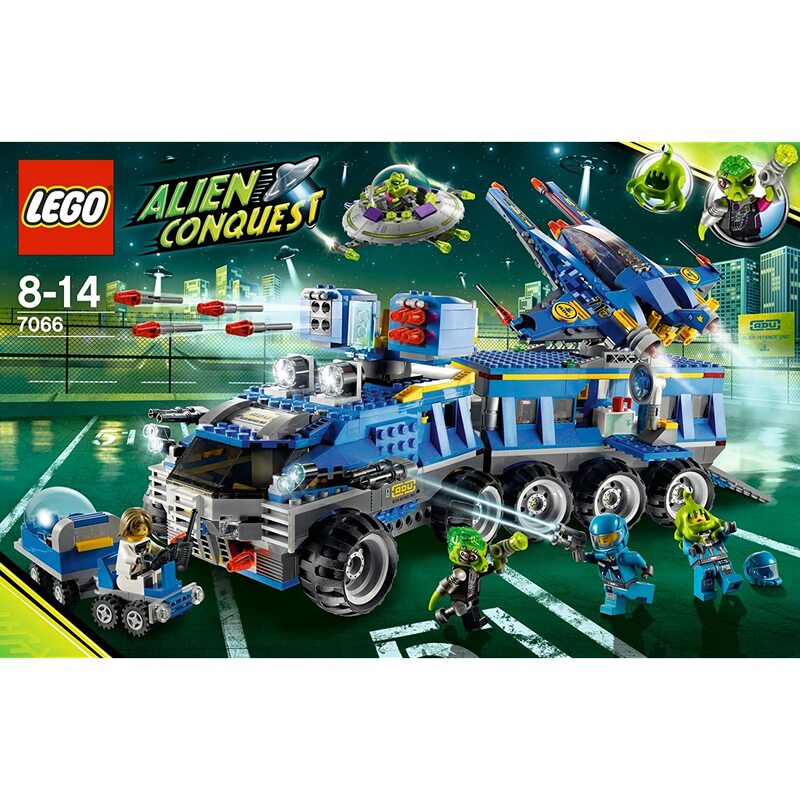 It’s the flagship set from the Alien Conquest theme, which also featured some cool B-movie flying saucers and green big-headed Martian invaders. Fun stuff! This set may seem pricey, and it is the most expensive of the line-up, but it’s at my comfortable threshold of about a penny a piece, and it actually came out ahead in that regard. Hooray for sales! It’s lucky, since this is actually a retired set, from the previous space theme (they bring out a new unlicensed sci-fi theme every couple years). This set in particular has a backstory to it that made it so much cooler and more desirable to me, too. See, there is a community of highly active and devoted people who love Lego, of all ages and nationalities (and why not? Lego just celebrated its 80th birthday and is available around the world). They call themselves AFOL, Adult Fans of Lego. Amongst them, there was a guy who went by the handle of Nnenn, who emerged several years ago as an inventive builder with a knack for designing cool space ships. One design he was fond of was variations on the ‘Vic Viper’, the playable space ship from the classic arcade shooter series “Gradius”, created by Konami. The Vic Viper is one of the most iconic fictional space ships in Japan and video gaming, with its characteristic split fuselage, rear-set cockpit, twin engines, and dorsal fin. Of interest to Lego builders, the ship is very achievable with bricks, has a great silhouette, can be subjected to endless modification and variation, and most important, is highly swooshable. So, Nnenn built many a fantastic Vic Viper variant, and even inspired an annual tradition in the form of Novvember (two V’s for ‘Vic Viper’, of course), where the worldwide community was encouraged to build and share their own Vic Vipers. Why did I say Nnenn was? Sadly, because he passed away in 2010 after a car accident. 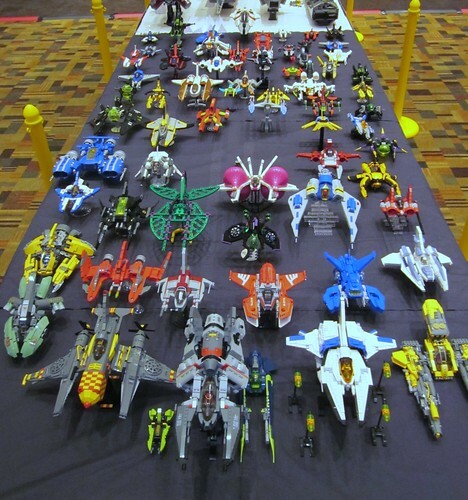 Immediately following that tragedy, the next major Lego convention hosted an event in tribute where folks were invited to ‘fly-in’ their Vic Vipers for a display in the traditional “missing man” formation. Also active among the online community was/is a man named Mark Stafford, who is also one of Lego’s set designers. He wound up designing the Earth Defense HQ set, and included several tributes to Nnenn. 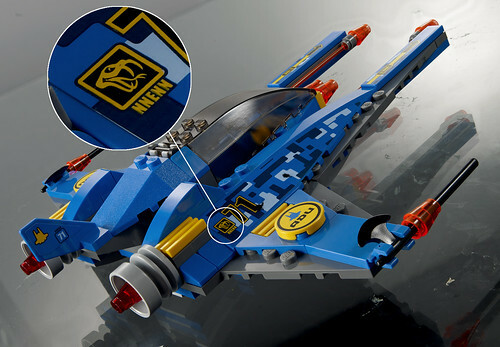 First, most visible is the Vic Viper design for the human starfighter, but there is also a decorative sticker with his handle beneath a wide-open grinning viper head. And thus, a man whose ship designs inspired so many of his fellow builders, Nnenn is forever immortalized in an official Lego set. Having never met or spoke to him, only admiring his work from afar, it does feel kind of voyeuristic to be so moved by the tribute, but I guess I’ll just have to deal with those emotions. Novvember remains an annual occurrence, and I imagine it will be so for years to come. Nnenn was establishing himself as a great builder around the time I began paying attention to the online Lego fanbase, and around the time I was coming out of my so-called “dark age” so the significance of this set and its tribute is seminal for me as well. I have yet to contribute anything visible to a Novvember, but I want to. Banal though it may sound, one of my big goals is to set up a dedicated Lego ‘workbench’ area, though I haven’t yet had a living situation that it’s really possible in. I want to try and dip my toe in the water this year, though… maybe I’ll add another category to that bar up top soon. Until then, I’ll be on the floor, putting together my cool new set, which is also cool because it is a throwback to the earliest space sets. The human characters stick to a color palette of grey, blue and yellow, and the set includes lots of “play features”, which is to say, multiple vehicles, lots of mini-figs, missiles, rotating parts, breakaway panels, and just lots of neat little details. I’ll also be watching a handful of builders online, picking up esoteric building techniques and NPU (“nice parts usage”). I invite you also to marvel at the creativity of folks such as Karf Oohlu, with his frog and monkey obsession, RongYIREN‘s delightfully chunky models, Cole Blaq‘s command of color and form, Ochre Jelly‘s expressive characters, Siercon and Coral‘s boundary-pushing techniques, Peter Reid‘s intricate detail work, and Nannan Z.‘s jack-of-all-trades, master-of-them-too creations. Yeah… so if AFOLs are adult fans of Lego, I guess I’m a bit of an AFOAFOL. This entry was posted in Chatterbox and tagged afol, aliens, C.S. Lewis, construction toys, lego, Nnenn, sci-fi, science fiction, space ships, Vic Viper. Bookmark the permalink.